Those tensions increase when Kara and Helo return from Caprica with Sharon, who is now pregnant and a dead ringer for the Cylon who tried to assassinate Commander Adama. Roslin orders Sharon put to death, but after meeting with her, she learns that the Cylon might be their best hope for finding the Tomb of Athena and the route to Earth. Doubt nags at Roslin, however: Is Sharon motivated by love for Helo, or by a desire to betray her captors? Regardless, she's a key player in Roslin's team as it lands on Kobol. With Zarek and Meier plotting fresh treacheries, the prophecies continue to unfold in bloody fashion. On the Galactica, Adama and Col. Tigh weigh their losses and rebuild the air group's chain of command, which has been plunged into disarray by the defections of Lee and Kara. Adama selects Lt. George "Catman" Birch to replace Lee as CAG (Commander, Air Group). Birch's first day on the job begins with a harrowing mishap during a Viper-pilot training exercise, then he turns a routine refueling operation into a near-disaster. 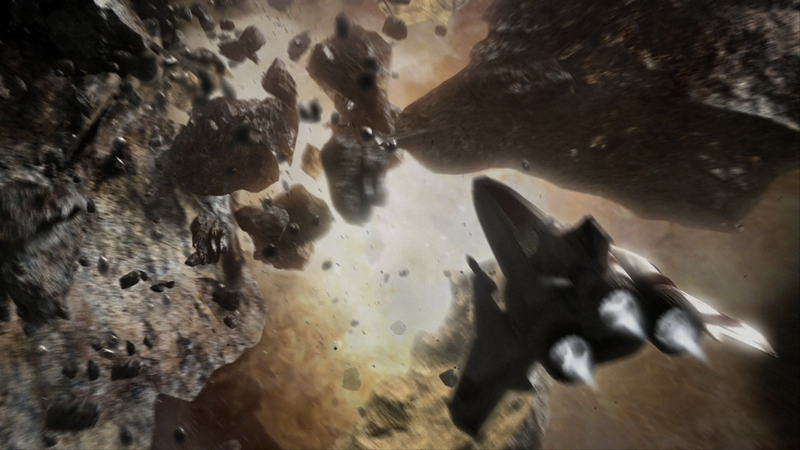 - Some of the types of ships in the fleet were identified in this episode. 12 transports, 7 freighters, 3 construction platforms, 1 private cruiser, and 1 mining ship (the Monarch). - One of the ships in the fleet, the Adriatic, is equipped with ship-to-ship missiles. - Regarding whether or not Sharon is capable of communicating everything Roslin says to her to the Cylons, she responds: "It doesn't work like that, I'm not wired in." - This is the first episode which does not feature an appearance of Tyrol. - Elosha: "The scriptures tell us that any return to Kobol carries with it a cost in blood." - Boomer showing up resulting in Apollo pointing his gun at Boomer and Helo pointing his gun at Apollo. - Helo: "Should we do what the nice lady says?" Apollo: "She's the president of the colonies you moron. And yes, we're going to do exactly what she says." - Roslin ordering Boomer out the airlock, betraying her word to Helo. - Roslin, regarding throwing Boomer out the airlock, after realizing she needs Boomer to find the Tomb of Athena: "Tell them to wait a minute." - Six regarding humanity: "They are masters of self destruction." - Elosha: "The scrolls of Pythia do speak of a lower demon who helped the people in a time of crisis." - The accident during the training exercise and Kat's impressive flying, saving herself. - Elosha: "And the blaze pursued them. And the people of Kobol had a choice. To board the great ship, or take the high road through the rocky ridge--" Boomer: "And the body of each tribe's leader was offered to the gods. In the Tomb of Athena." Elosha: "Yes, precisely." Boomer: "And the great ship was the Galeon that departed from here where we're standing. And it took the founders of the 13 colonies to their destiny. And those that didn't board the Galeon took the high road." - Boomer taking out the last of the Cylon Centurions. - Adama discussing betrayal with Dee. - Adama announcing he's going to reunite the fleet. This episode is the natural evolution of the plot arc that was introduced in the season one finale. Roslin has now embarked on her quest to find the Tomb of Athena on her own, and Starbuck has returned to Roslin with the Arrow of Apollo as planned. Well, not entirely according to plan, but the end result is the same. The episode opens with a great teaser. Showing us what's going on with Roslin's fleet, Starbuck appearing, and the confrontation regarding Boomer. The way it plays out is also wonderful. I love how Roslin betrays her word to Helo by ordering Sharon thrown out the airlock, then reconsiders when Boomer starts talking about knowing where the Tomb of Athena is. My favorite line is when Roslin says, "tell them to wait a minute." The callous, nonchalant way she says that is just perfect. Unfortunately the episode seems to run out of steam a bit after this. We get to spend a lot of time watching Birch screw up routine operations over and over. Then there's the immature pyramid ball scene. These details were nice, especially the visual effects regarding Birch's screw ups, but many of the character conflicts felt redundant to me. We didn't really need them, not really. Originally, this episode was slated to not be a two parter. So that can explain why some of it seems to drag in places. But overall the episode is still fairly remarkable. The Cylon firefight was its usual spectacle to watch, the visual effects depicted in Birch's screw up missions were utterly fantastic, especially Kat's brush with death, and it was interesting to watch Adama slowly come to terms with what he needs to do.